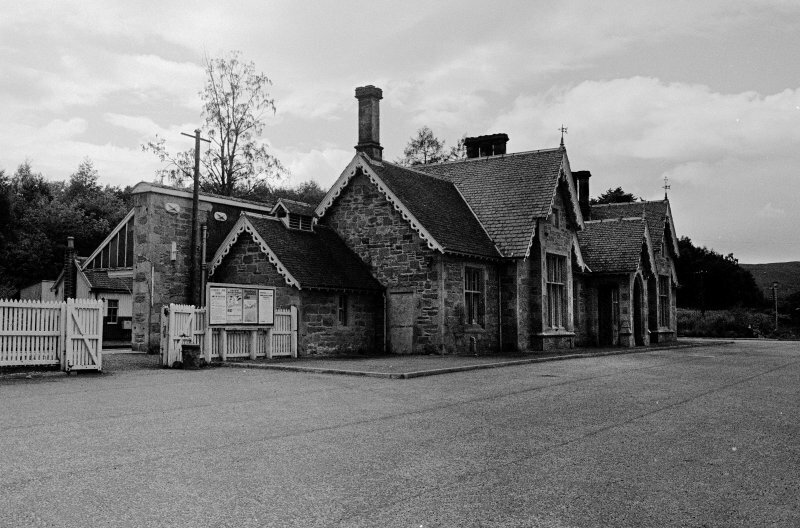 Dunkeld, Dunkeld and Birnam Station General view of forecourt. 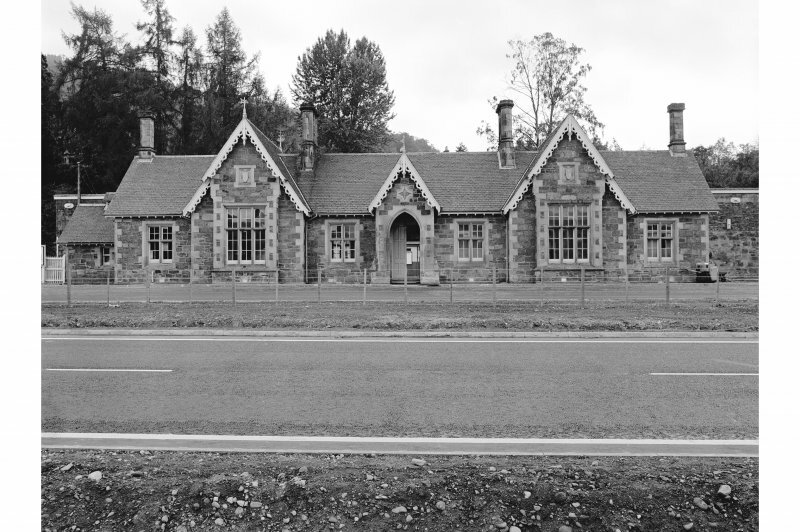 Architect: Andrew Helton, Junior, 1856. 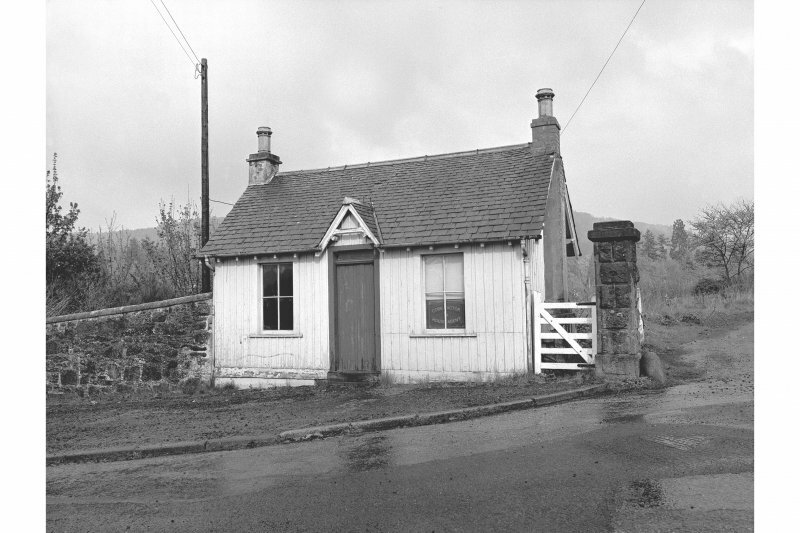 (Location cited as NO 031 417). 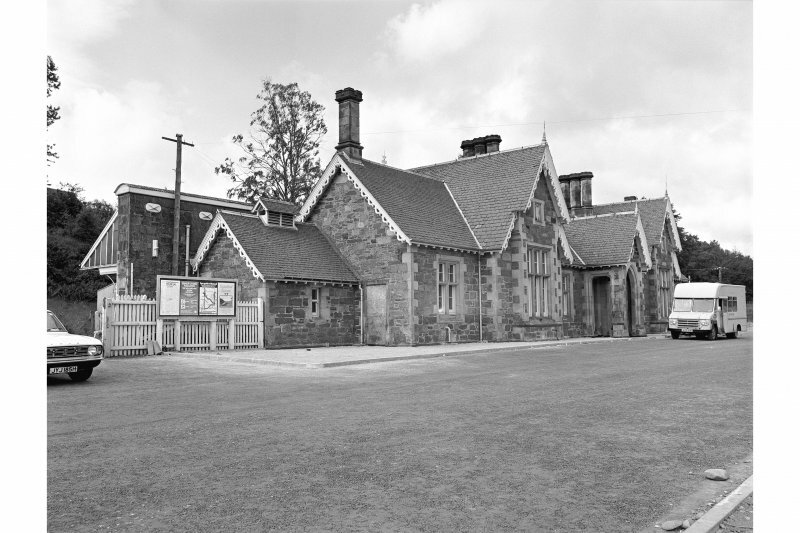 Dunkeld and Birnam Station, opened by 1856 by the Perth and Dunkeld Rly, architect Andrew Heiton. 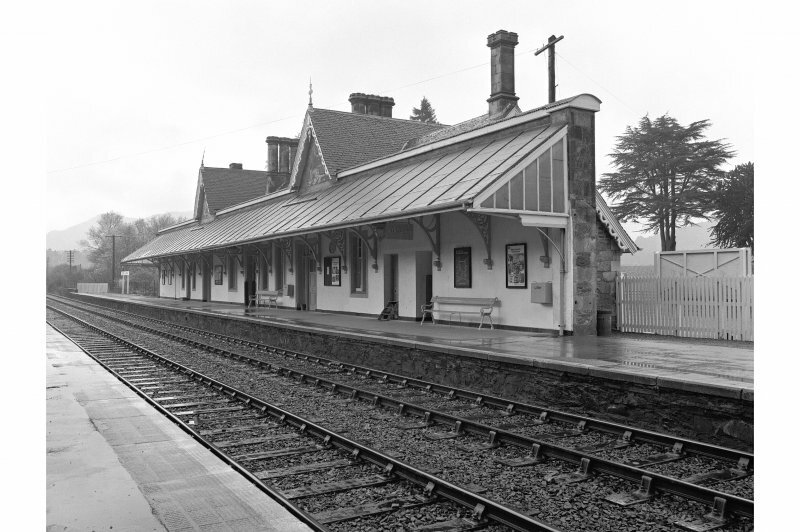 A two-platform through station with the main building on the up platform, a fine single-storey structure with two ornamental gables and a projecting porch at the rear. 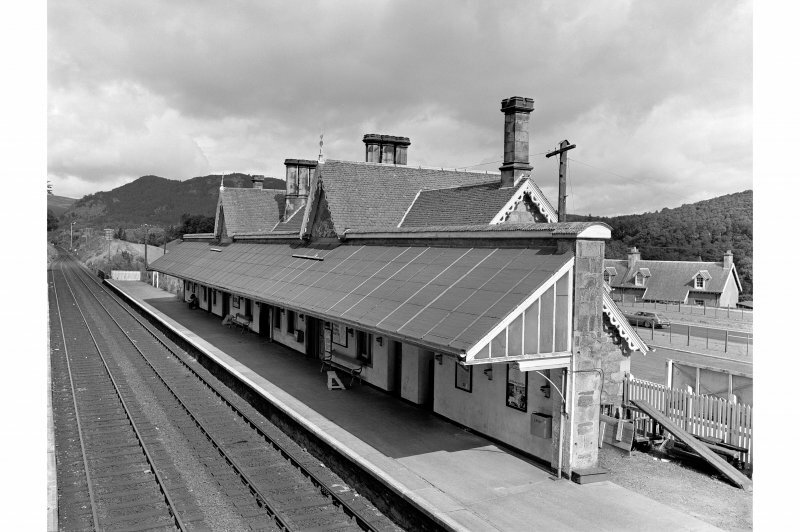 On the platform side is a bracketted awning with a steeply-pitched roof. 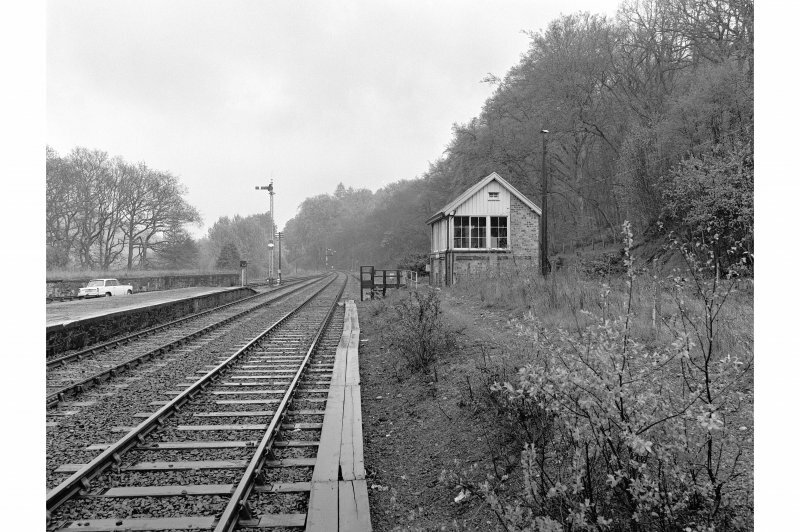 There is a small wooden shelter on the up platform. 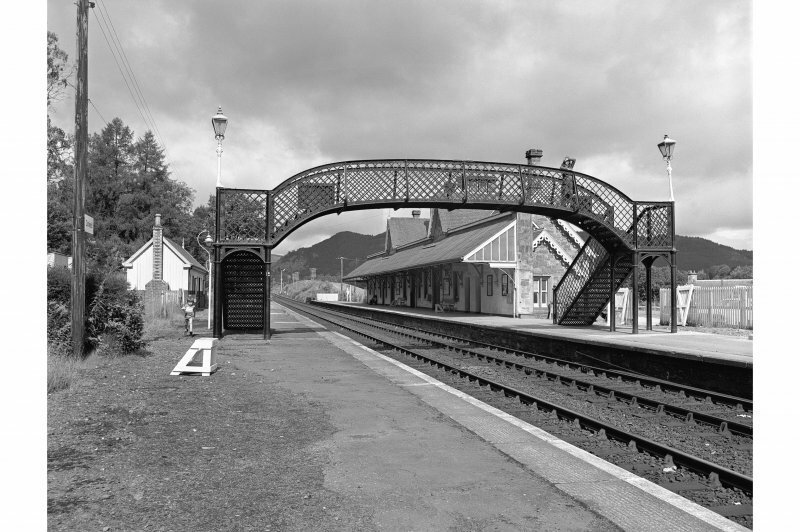 Other features are a rubble goods shed, a neat wooden coal office, and a lattice-girder footbridge. 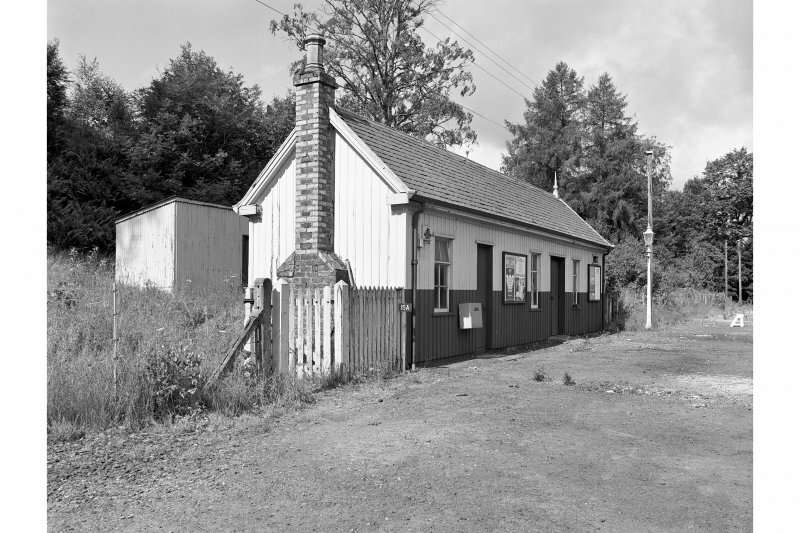 This intermediate station on the Perth (Stanley Junction) - Inverness main line of the former Highland Rly was opened as Birnam and Dunkeld Station by the Scottish Midland Junction (Perth and Dunkeld) Rly on 7 April 1856. 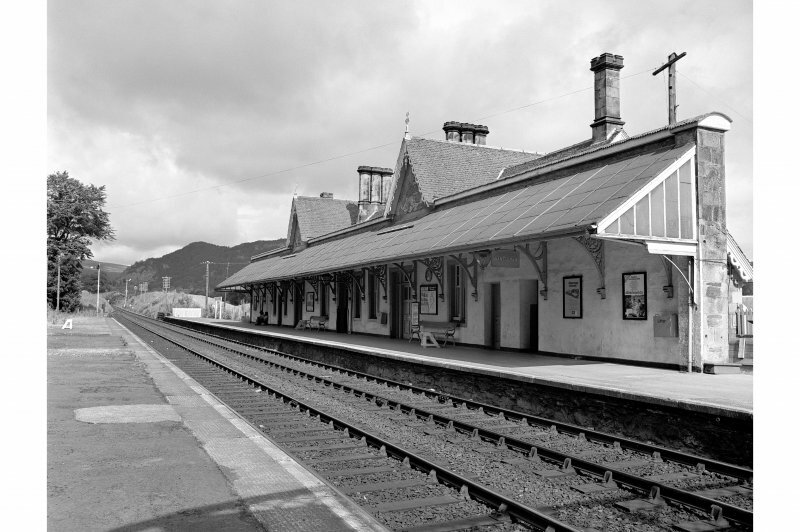 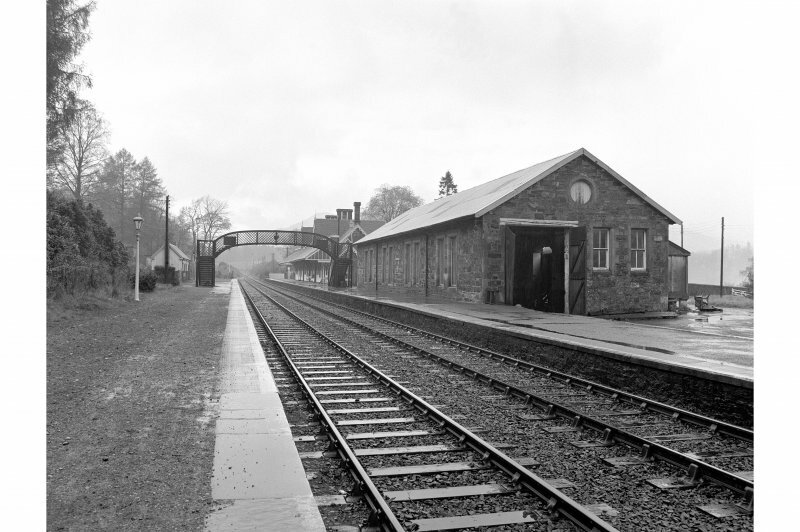 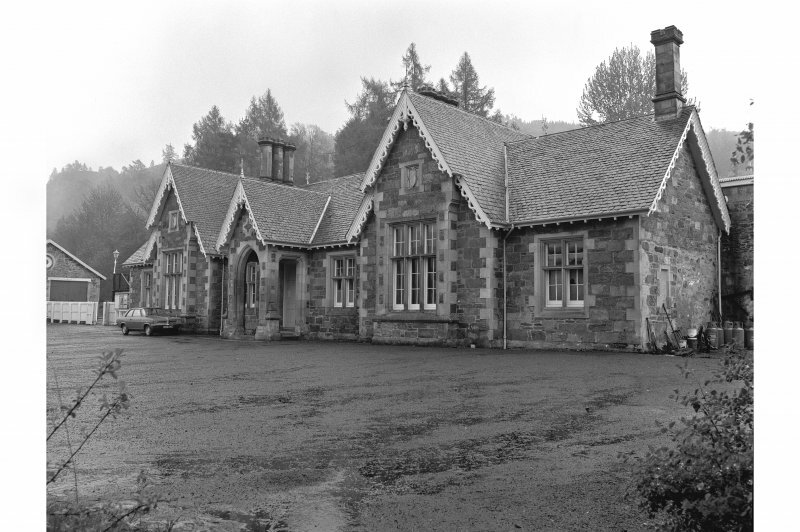 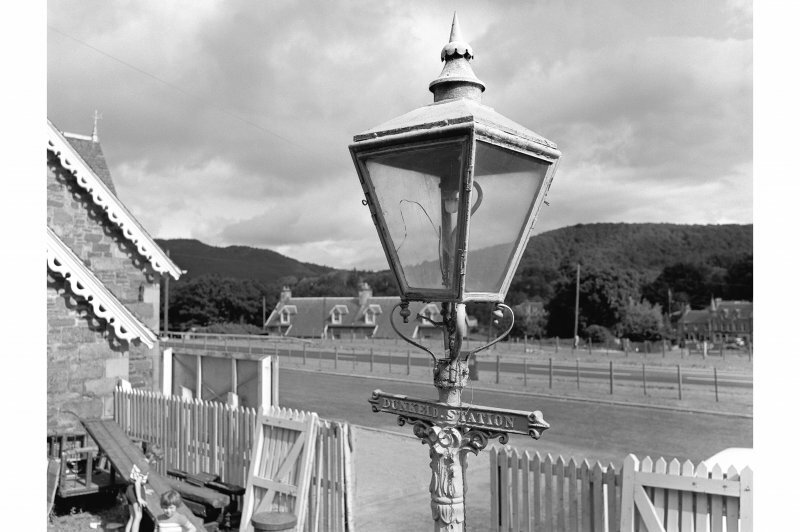 It was sucessively renamed Dunkeld Station on 1 December 1861, Dunkeld and Birnam Station on 1 December 1903, Dunkeld Station on 12 May 1980, and Dunkeld and Birnam Station on 13 May 1991. 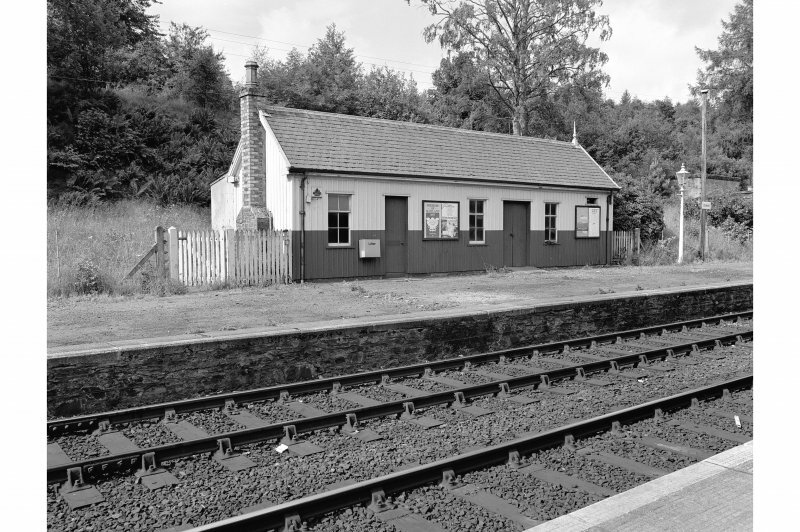 The station remains in regular use by passenger traffic under the last name. 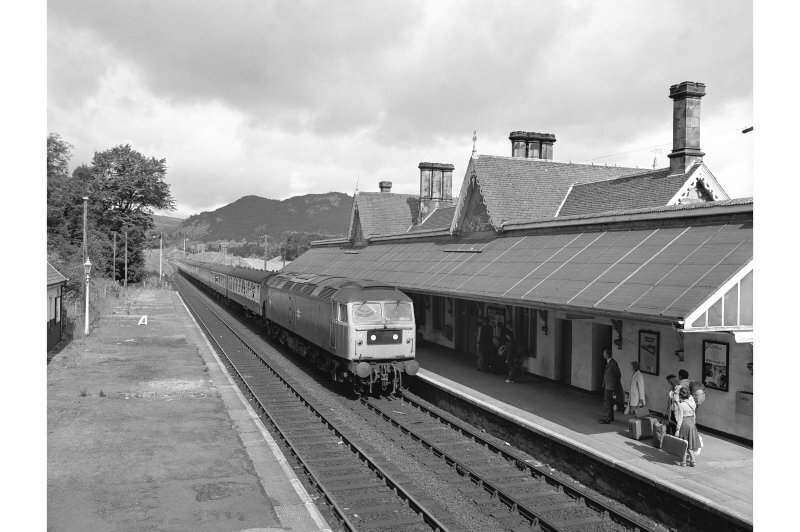 Information from RCAHMS (RJCM), 4 September 2000.